Handcrafted by mosaic artists, Edgewater by Studio E is a glass tile (and mixed media) collection that will add brilliance and glamour to any design. Comprised of recycled bottle glass, each tile is melted, cast and cut by hand to create a distinctive yet durable green building material. Suitable for walls and floors, Edgewater is the perfect choice for both indoor and outdoor living spaces. 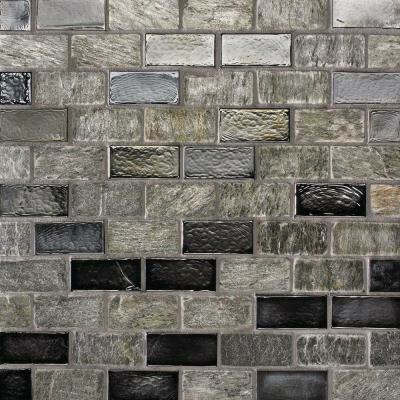 Featured on backsplashes and vanities or fireplaces and barbeques, mosaic glass tile will work beautifully with any design style ranging from traditional to contemporary. The collection offers both soft, creamy neutrals that will complement most color schemes as well as striking, metallic finishes which lend themselves to stunning design statements. Complete your installation by including a gorgeous, coordinating Edgewater glass tile liner. Eco-friendly, beautiful and enduring, Edgewater by Studio E is the perfect selection for any of your tile needs. You can buy this product in our internet market. We will be glad if you make the right choice. Random tone difference in shade and color variation is part of the natural beauty of this handcrafted product. P.E.I. Rating II - Suitable for light duty floors, most areas of home except kitchens and entrances. Water Absorption is more than 7%. Indoor use. Slip resistance / Coefficient of Friction Rating is greater than .5 which is recommended for standard residential applications and is marginally skid resistant. Don't forget to complete your design with coordinating Edgewater liners. Shipping: All online orders for this item may arrive in multiple boxes if orders ship via parcel ground. Please refer to the Installation Guide pdf for further detailed usage recommendations and installation instructions.